So, when I said I’d bring something to a charity bake sale, I had to come up with something more than a vanilla cupcake. Don’t get me wrong–I love vanilla but I had to do something with the Sugar & Wine flair. So, I landed on strawberry shortcake cupcakes. 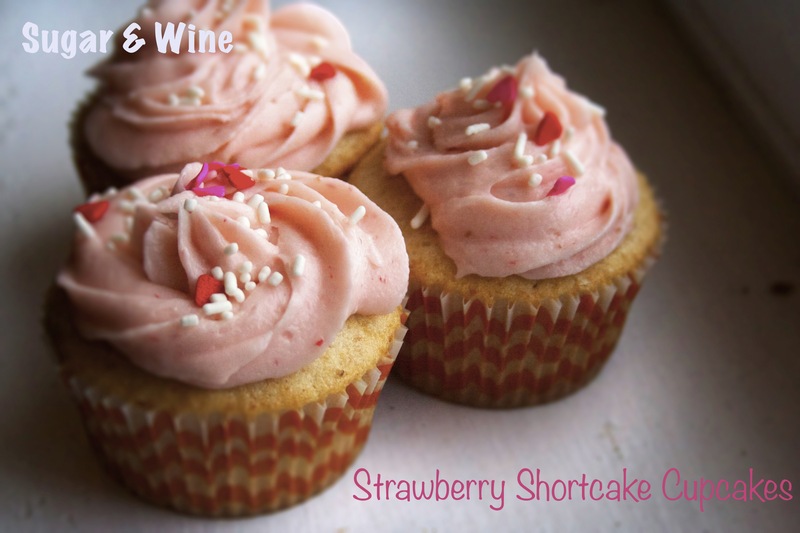 Now, these cupcakes aren’t just your typical run-of-the-mill strawberry cupcakes. They have a little shortcake touch to them. What does that mean, you ask? Well, they are a little denser than a regular cake and remind me of my all time favorite dessert. The original recipe was a light on the strawberry flavor so I kicked it up a notch. With this recipe, you can taste the strawberry in every bite. Add a little bit of sprinkles and you got yourself a cupcake that will wow your guests. Thanks for your patience while I got my camera fixed. It was holding my fabulous pictures hostage and I couldn’t get them out! Two cords and a new software download, and I’m back up and running! Preheat the oven to 350 degrees and line a muffin tin with your favorite cupcake liners. Set aside until later. Now it’s prep time. In a bowl, whisk together the flour and baking powder—and set aside. Puree strawberries in a food processor. Then, in a small bowl, mix together the puree, vanilla and mix. Set it aside as well. In a stand mixer with a paddle attachment, cream together the sugar and butter until smooth on medium speed. Once completely mixed, add in the egg and egg whites until blended. On low speed, begin alternating the flour and milk mixtures. Begin by slowly adding 1/2 half of the flour mixture. Once blended, add the milk mixture. Finally add in the remaining flour. Make sure to scrape the sides of the bowl down to ensure the batter is fully mixed. Fill the cupcake liners about 2/3 of the way and bake for 22-25 minutes. Use a toothpick to determine whether the cupcakes are done. They are done when they are slightly browned and the toothpick comes out clean. Let the cupcakes cool and then ice them—enjoy! Puree strawberries in a food processor and set aside. In a stand mixer, cream together the vanilla and butter on medium speed. Reduce mixer speed to low and add in the powdered sugar one cup at a time. Once fully mixed, add all of the strawberry puree until incorporated. The original cupcake and buttercream recipes are slightly altered from the Sprinkle’s cupcake recipe can be found here and here.